Make expense reporting effortless! Zoho Expense automates business and travel expense management. It dramatically reduces the time required to record receipts, prepare expense reports and get them approved. Zoho Expense is a true perk for traveling employees, for managers who have stacks of expense reports awaiting approval. Here's what Zoho Expense brings to the table. 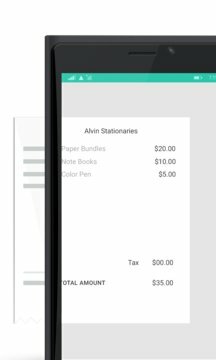 - Store receipts digitally. Drop the paper receipts. - Automate recording of expenses. Zoho Expense automatically creates expenses from the receipts you upload. With auto scan and human verification, all major details like date, merchant, amount, etc, are captured in the expense. - Easy expense reporting. Tap to batch expenses together to create an expense report and submit to your manager via email. 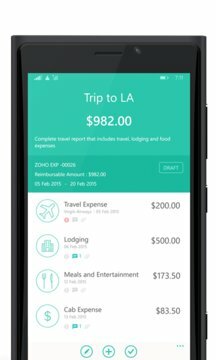 Our mobile app is a extension of our web application Zoho Expense https://www.zoho.com/expense . Download & Signup for a 14 - DAY FREE TRIAL to manage your business expense reports on the go.